Welcome to the database of photographs held in the Fiske Icelandic Collection. 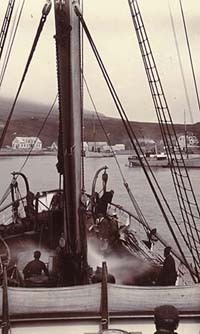 The Icelandic and Faroese photographs of Frederick W. W. Howell and the Icelandic photographs of Henry A. Perkins and Magnús Ólafsson are currently available for viewing and research. Please note that the images in this database are for research purposes. They are not of publication quality. Cornell University Library owns these images as physical property. Researchers are responsible for obtaining permission from copyright holders for use of any images that may be under copyright. For information on reproduction and use of these images (including crediting the Division of Rare and Manuscript Collections), please contact the Permissions Coordinator, Division of Rare and Manuscript Collections, Cornell University Library, at cjl10@cornell.edu.